A couple of days into the registration of FIR against the Lal Masjid cleric Abdul Aziz, the mullah who won’t condemn Peshawar massacre, the lawyer and activist Jibran Nasir received a threatening telephone call from Taliban faction group Jamaatul Ahrar’s spokesperson Ehsanullah Ehsan. Jibran told to DawnNews TV channel that it was confirmed to him by the security institutions that the threatening call was authentic. In the telephone call from Afghanistan number, Ehsan is heard giving blatant threats to Jibran and his family, telling them to back off and to stop Mullah Abdul Aziz and other Taliban elders. Ehsan warned Jibran of dire consequences if he didn’t back off. In an event like this, anyone of us will be scared sh*tless and probably back off but the way this young activist Jibran responded will shock you! Not only he answered the phone in a calm manner, he told Ehsan that he will stand firm for his cause until the mosque starts preaching the message of peace and love. 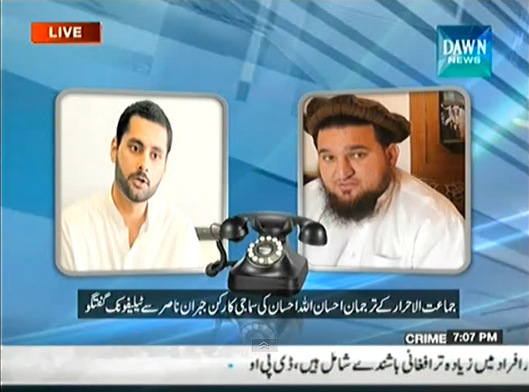 Here’s a video of the activist Jibran talking to DawnNews. This includes the audio of the threatening call. Jibran told to Dawn that he doesn’t fear anymore because it is time that we don’t have anything to lose. Jamaatul Ahrar is the same group that carried out Wagah Border attack last month. Meanwhile, the members of civil society led by Jibran continue to demonstrate in the federal capital, urging the police to arrest Abdul Aziz now that the FIR has been registered.